I don’t wish to sound like some sort of unhinged cemetery fetishist, but I love a good cemetery. All the art, culture and meaning that we devote to death is extraordinary; something that sets us apart as a species and, ironically, inspires a level of creativity that transcends day-to-day life and death itself. Cemeteries are designed to accommodate the living as well as the dead, otherwise why expend such energy making them so attractively solemn? 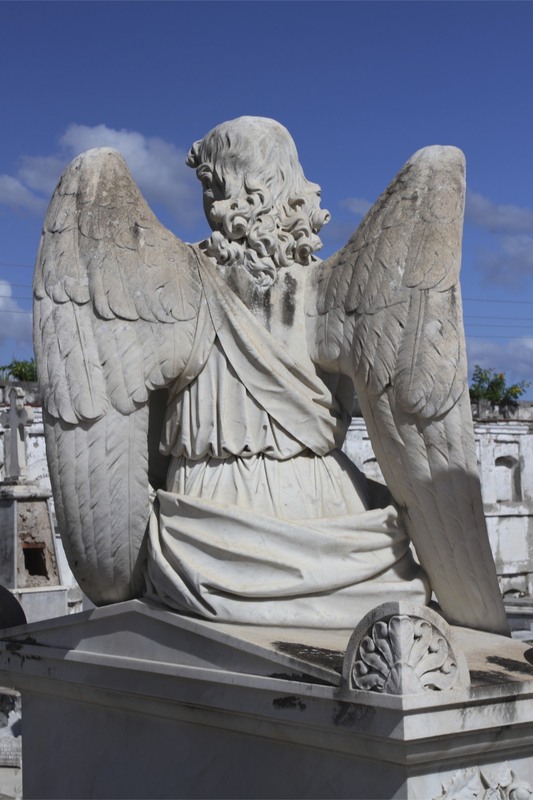 Cuba has several interesting colonial-era cemeteries worth exploring for their history and artistry. 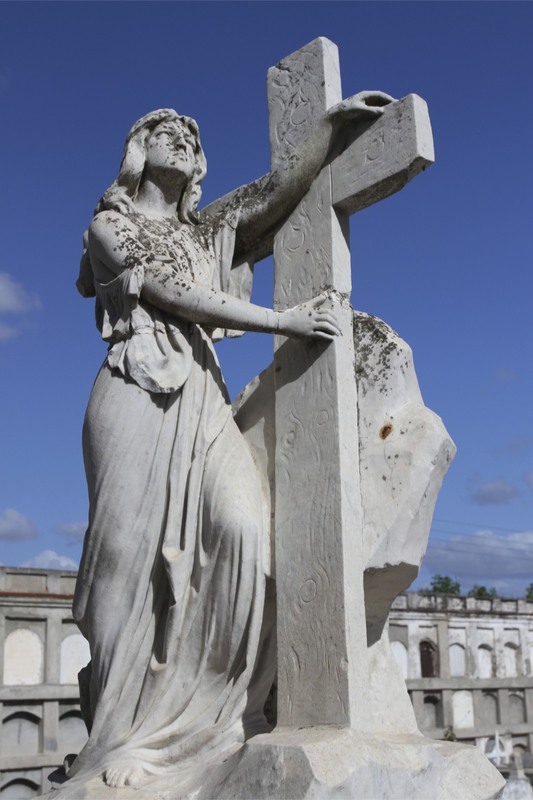 Cienfuegos’ oldest cemetery is no exception, elegant funerary art shows off the wealth of those buried here. 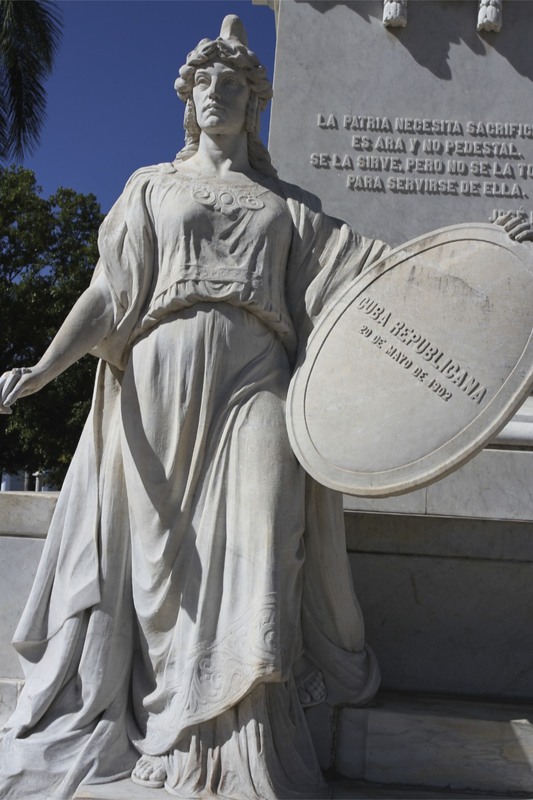 Interestingly, most statues seem to be of female figures. 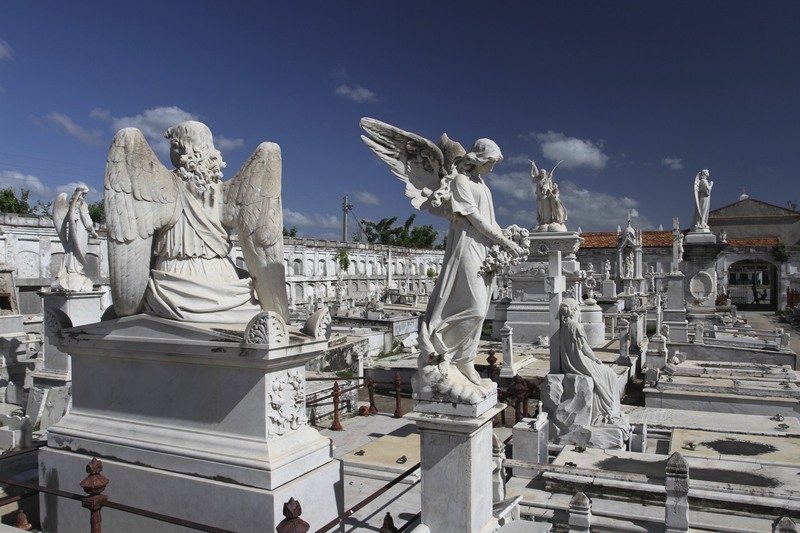 It may only be a fraction of the size of Havana’s Cementerio de Cristóbal Colón, and without the luminaries who inhabit it, but the Cemetario or Necrópolis de la Reina makes up for its diminutive size with an outsized amount of atmosphere. 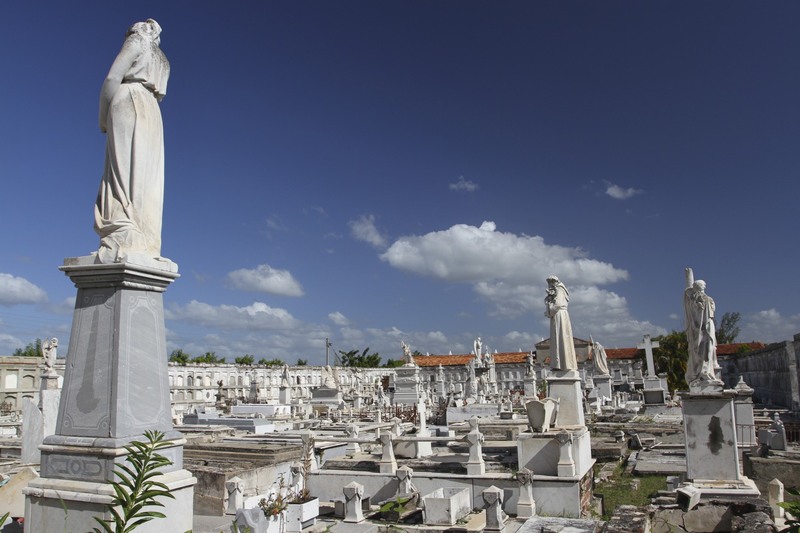 Built in 1837, and named for Queen Isabella II of Spain, the Cemetery of the Queen is a characterful place. For a cemetery at least. 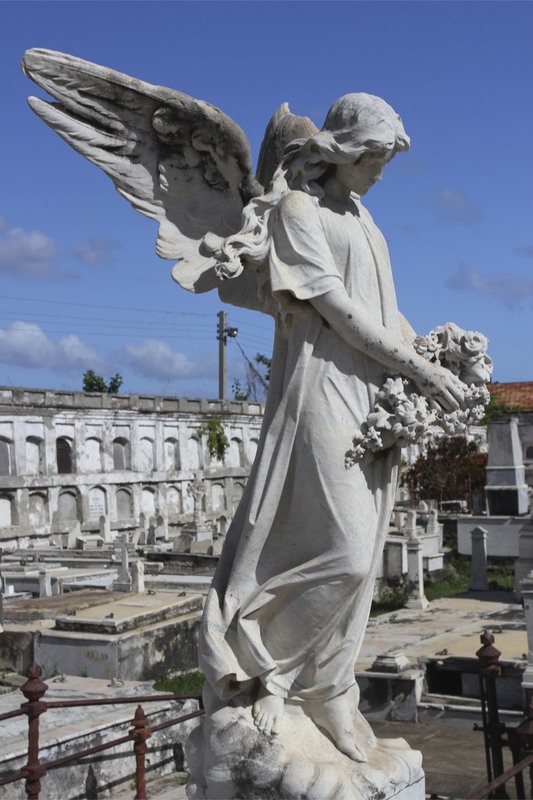 The cemetery is filled with wonderful marble statues, the white stone gleaming under a hot sun; gracefully decaying tombs are surrounded by elegant iron railings. 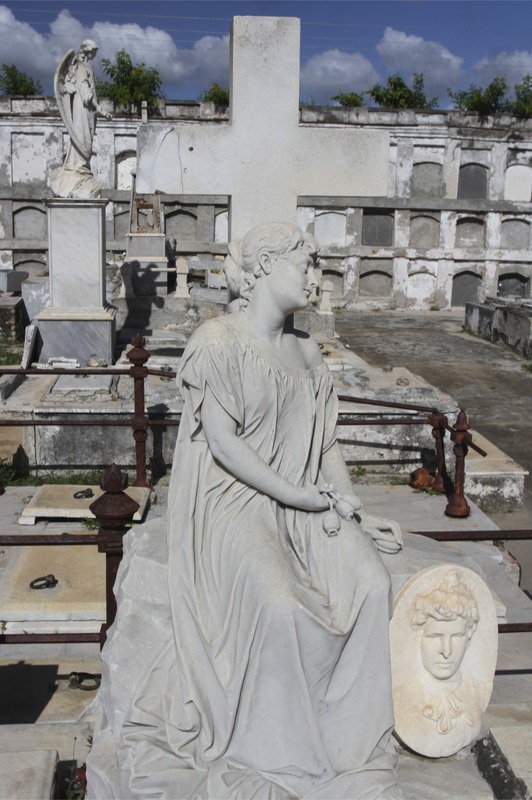 Amidst the many grand and ornate graves of local people, and those of patriots from the Wars of Independence with Spain, sits the most famous grave of all: the burial place of La Bella Durmiente, the Sleeping Beauty. 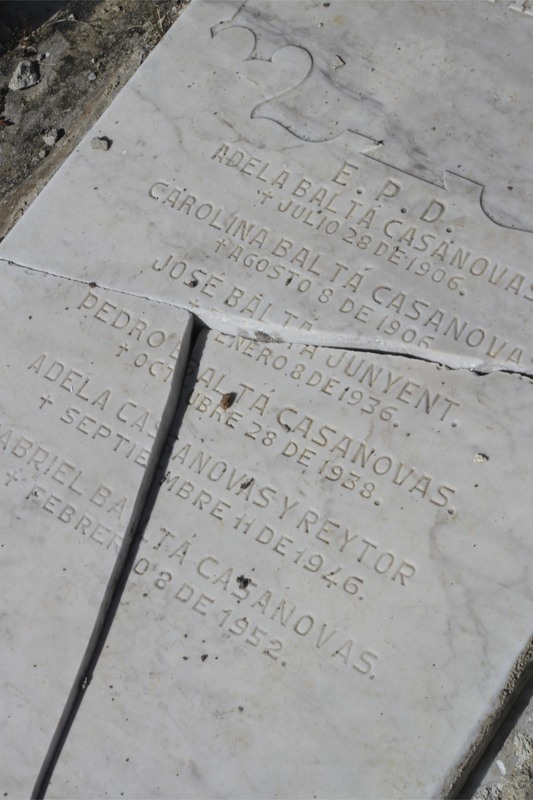 This is the grave of a 24-year-old woman who died in 1907, allegedly of a broken heart – no Latin American cemetery would be complete without a story shrouded in myth. 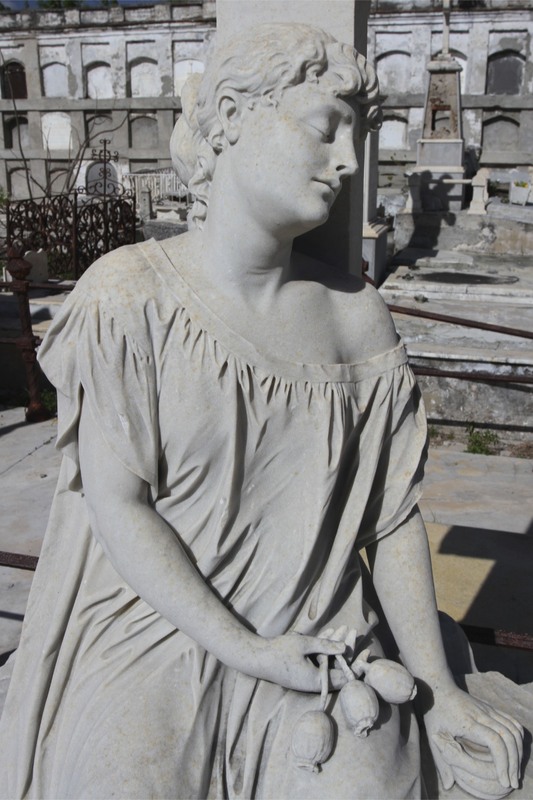 Of the many exquisite statues, La Bella Durmiente is famous for its refined carving. 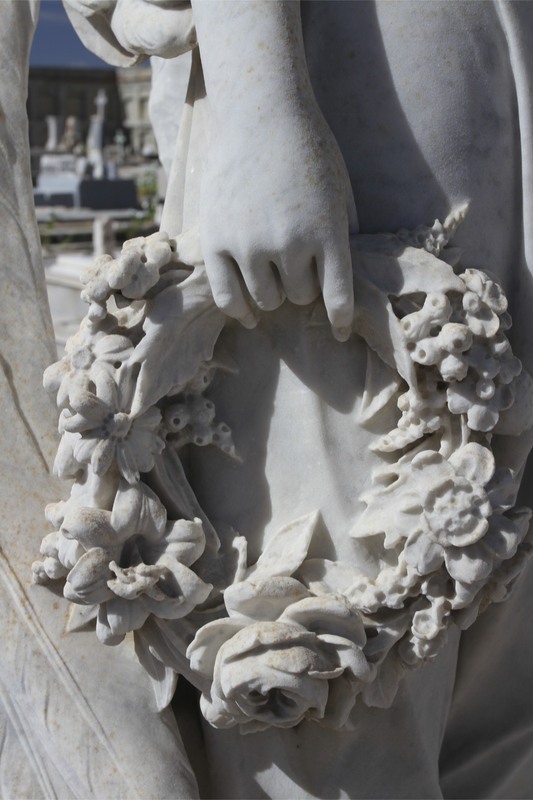 It was made from Carrara marble and carved in Genoa, Italy, before being shipped to Cuba. 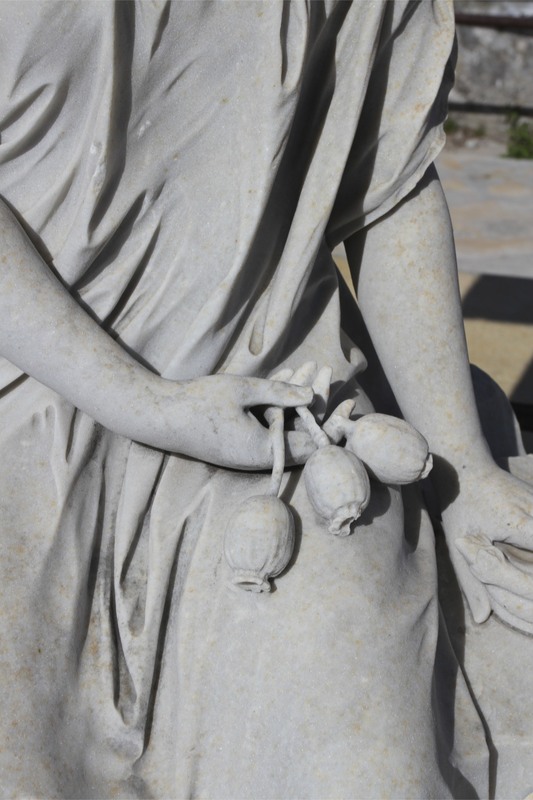 In her hand are three poppies, traditional symbols of sleep and death. 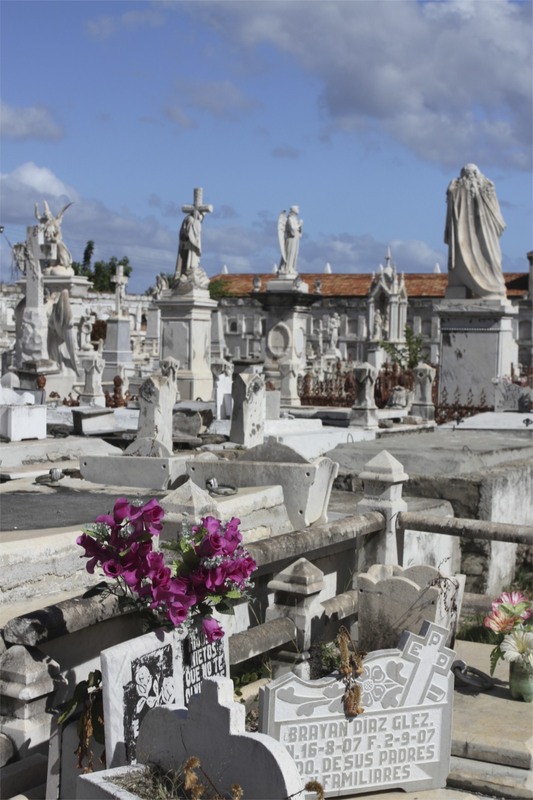 The cemetery became a national monument in 1990, just in time for the collapse of the Soviet Union and the implosion of the Cuban economy. 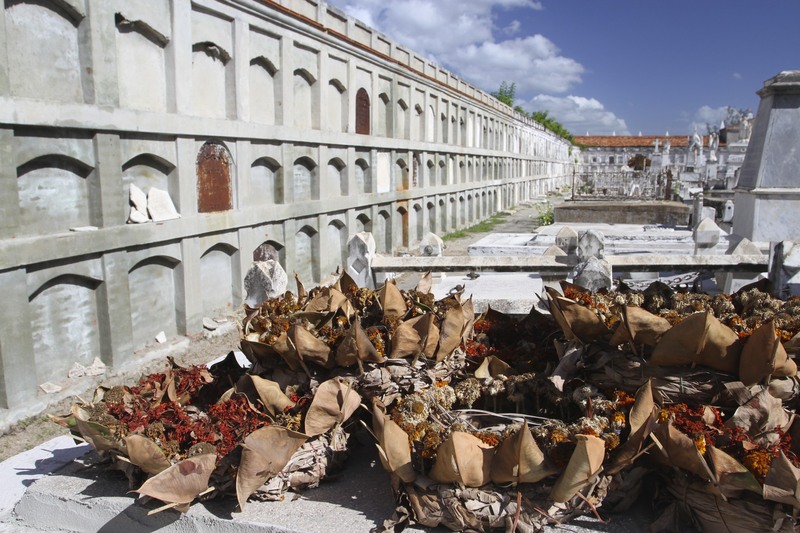 Like much else in Cuba, it has fallen into disrepair and many of the tombs are slowly decaying in the tropical climate. 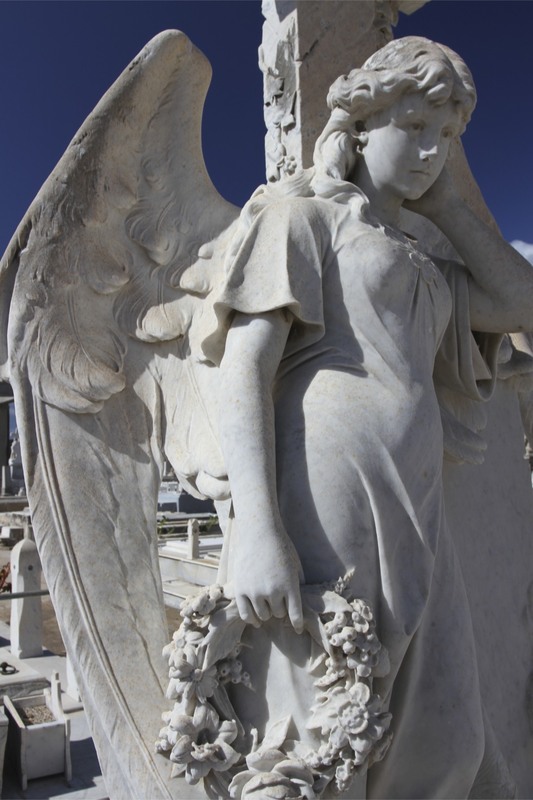 Recently though efforts have been made at renovation, and some tombs have been returned to their former glory, but all that Italian marble costs a lot to maintain. 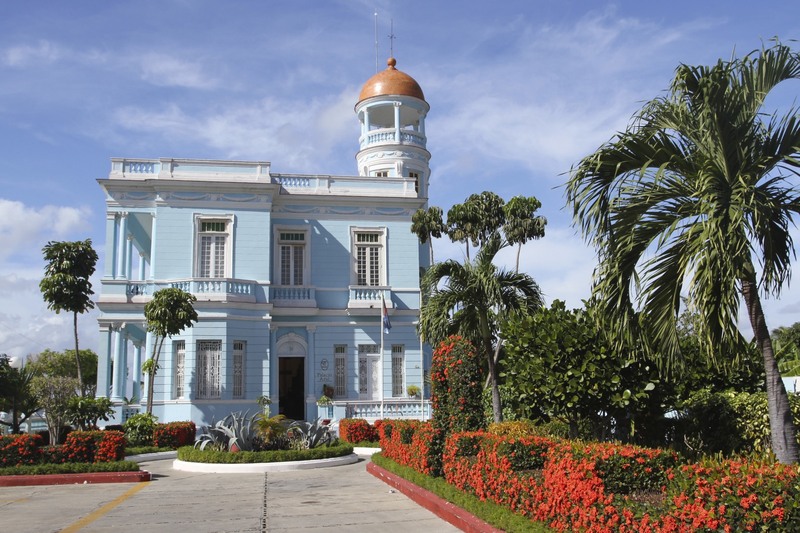 Visitors to Cuba with limited time often skip Cienfuegos in favour of Trinidad, or even far away Santiago de Cuba. Yet the Pearl of the South, as it’s known, is as relaxed as it is beautiful. 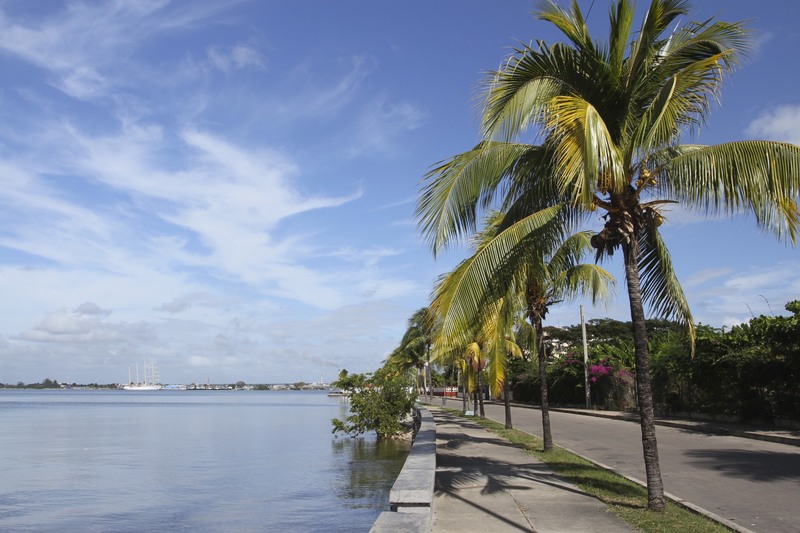 It’s a gorgeous city, with French-tinged architecture and an enviable location on the shore of the Bahía de Cienfuegos. No surprise then that it was awarded UNESCO World Heritage status in 2005. 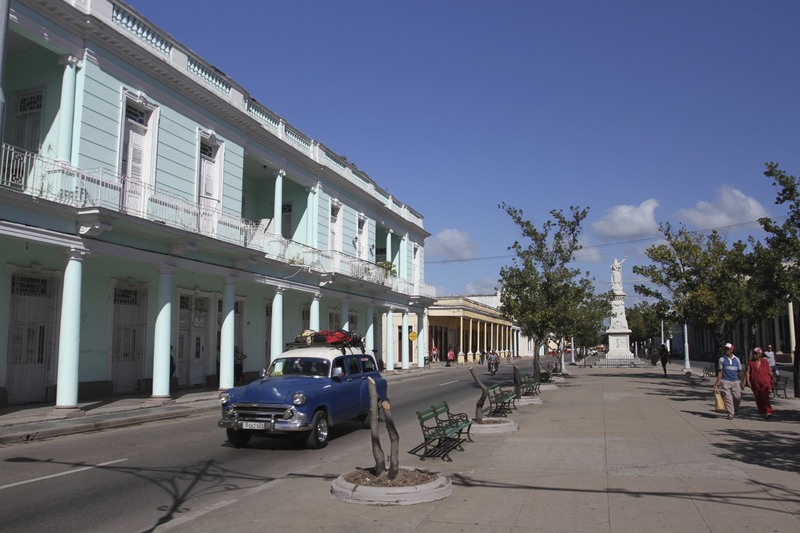 The city was founded in 1819, making it a relative newcomer in Cuba. 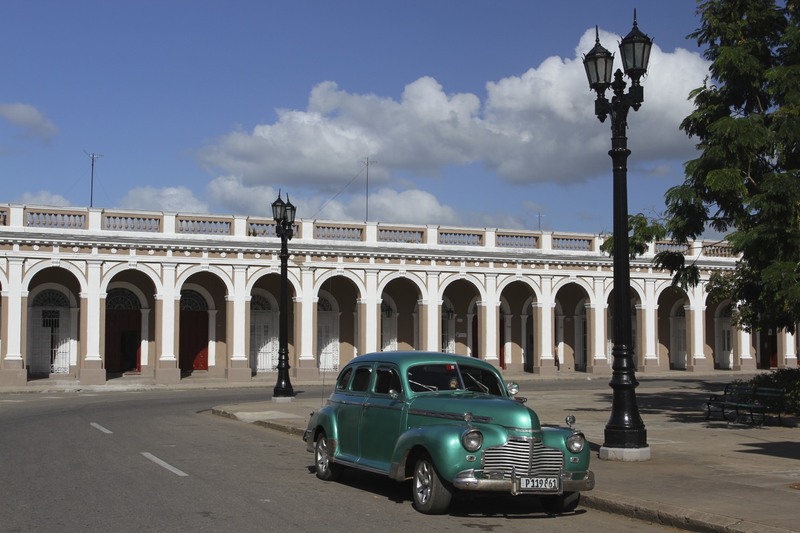 In one of those quirks of history, in Spanish-controlled Cuba, Cienfuegos was founded by French immigrants from Bordeaux and various French colonies, including ‘nearby’ Louisiana. 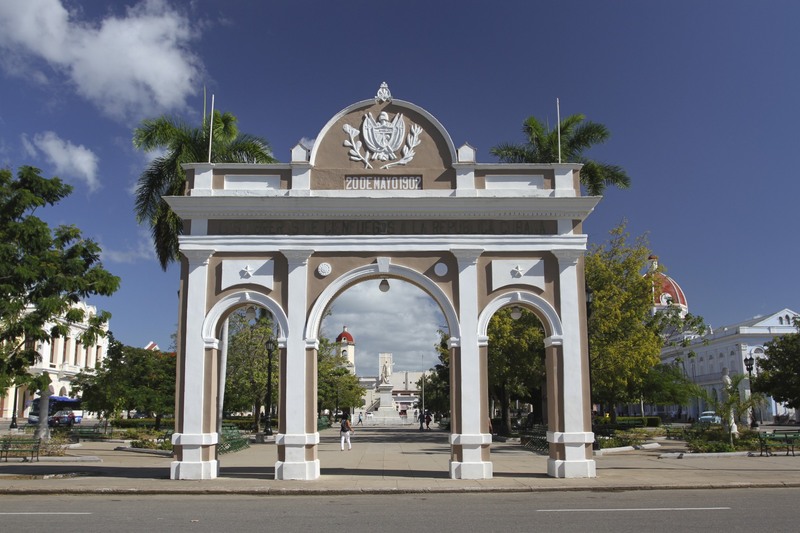 The French influence is reflected in the neoclassical architecture lining stately boulevards. This is a city with lots of grace and lots of space. 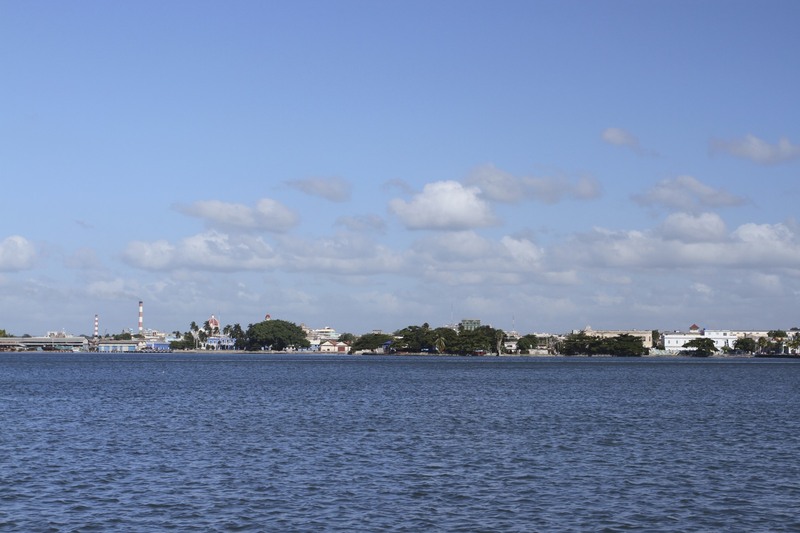 We walked a lot in Cienfuegos, there’s not much traffic and although it was hot you get a breeze off the water. 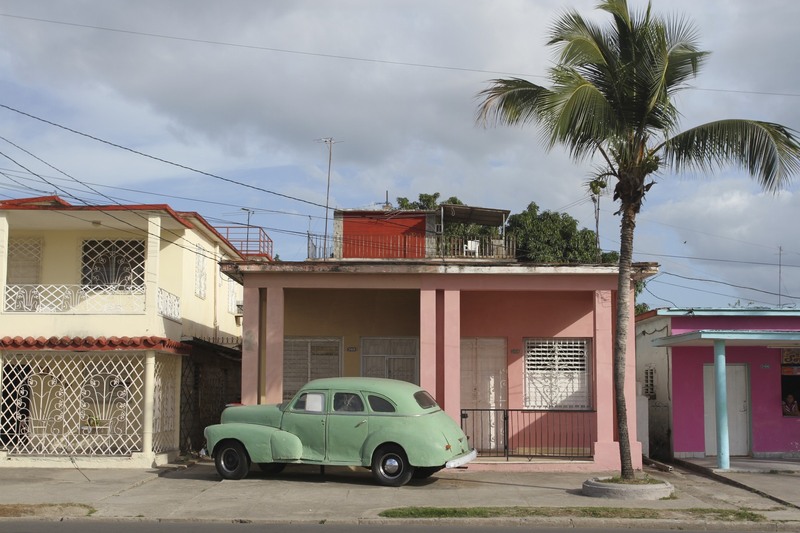 Going from neighbourhood to neighbourhood the wondrous rainbow of colourful buildings, in which Cuba specialises, will be one of my defining memories – vibrant pastel colours illuminated by a bright Caribbean sun. 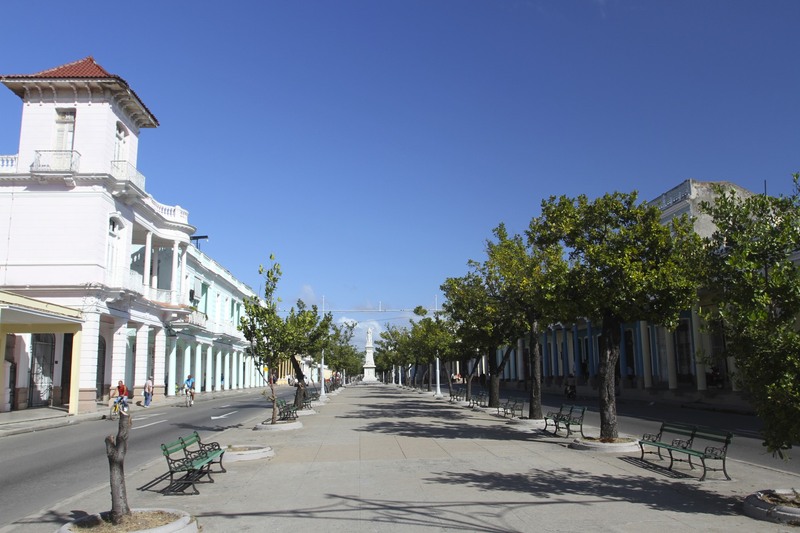 Leaving the original 19th Century city behind we walked down the Paseo del Prado, which eventually becomes the bay side Malecón and offers sweeping vistas over the water to the city. 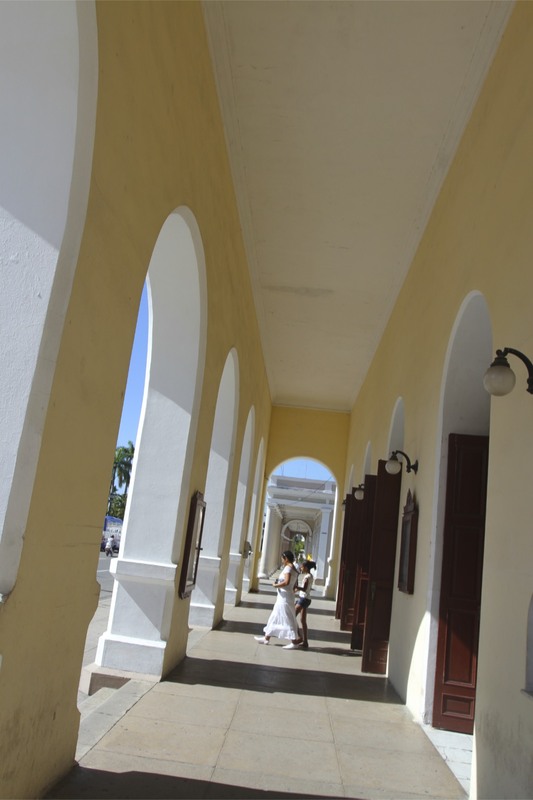 We were headed south to Punto Gorda, and back in time to the 1930s. 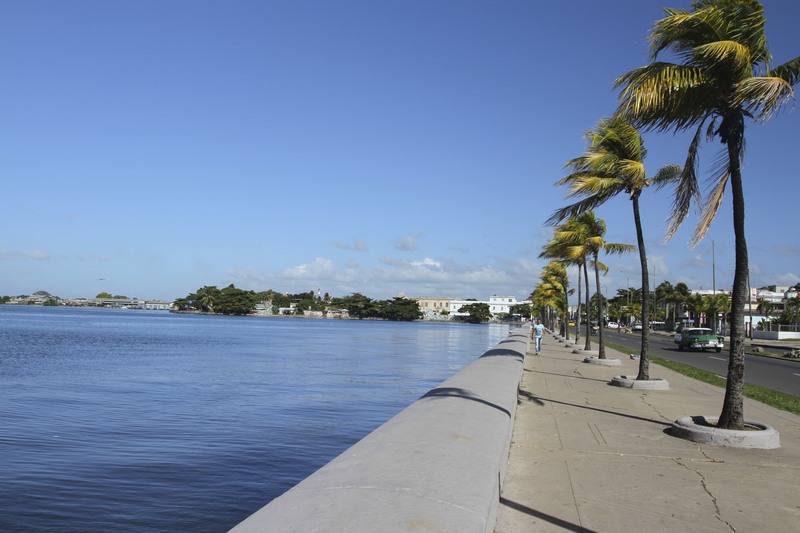 Punta Gorda, a formerly wealthy suburb, stretches down a long peninsula that ends at a small park with lovely views. This area feels like a different country, filled with grand mansions (the best of which are now state-run hotels) and Art Nouveau sea-side houses. 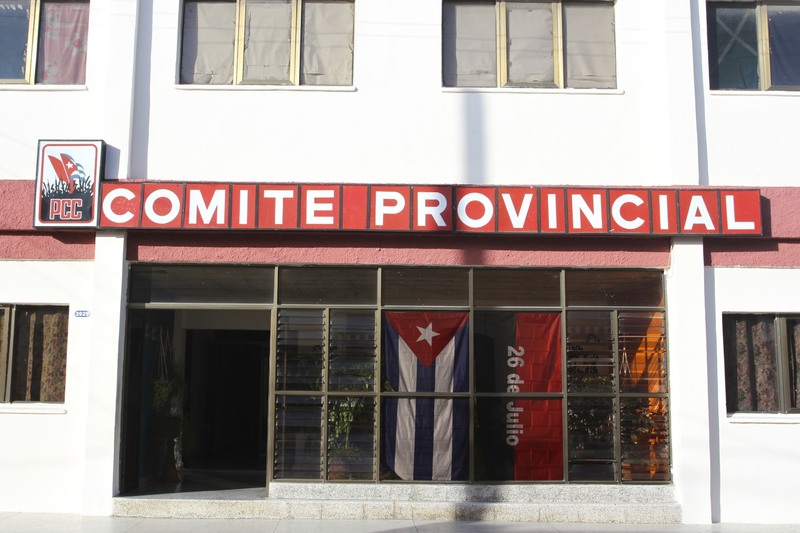 It could definitely be a suburb of Miami and pre-revolution it was home to Cienfuegos’ wealthy elite. 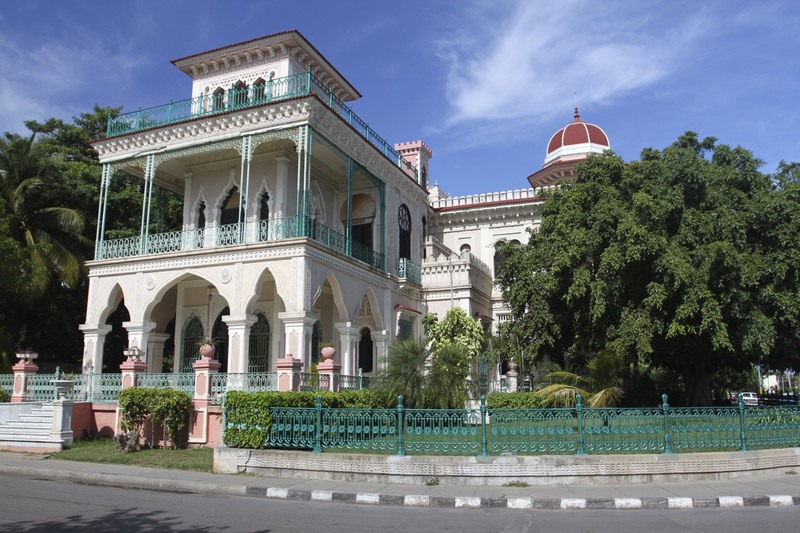 Near the end of the peninsula sits Punta Gorda’s most extravagant building, a Moorish fantasy called the Palacio de Valle. It looks like it belongs in Cordoba or Marrakech. 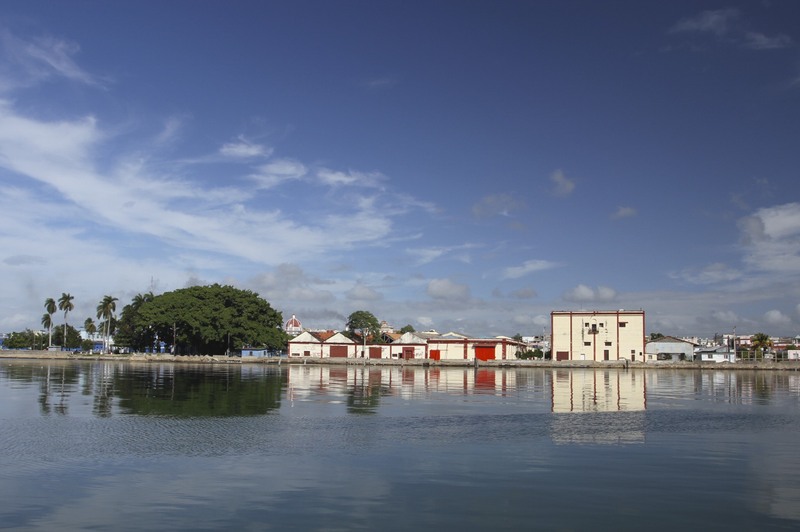 We walked back towards the city along the waterfront and stopped in at one of Cienfuegos’ best restaurants, Finca del Mar. 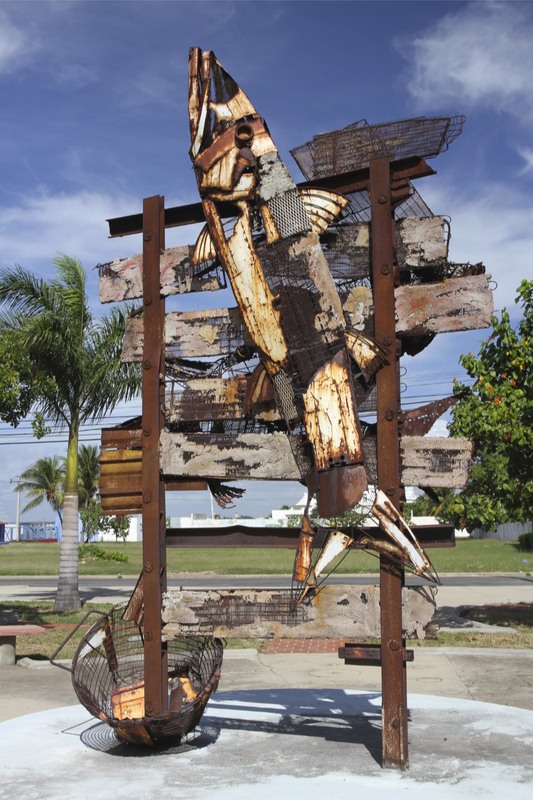 Cuba does good seafood and, sitting at a table in the restaurant’s garden a stone’s throw from the water, only made it more delicious. 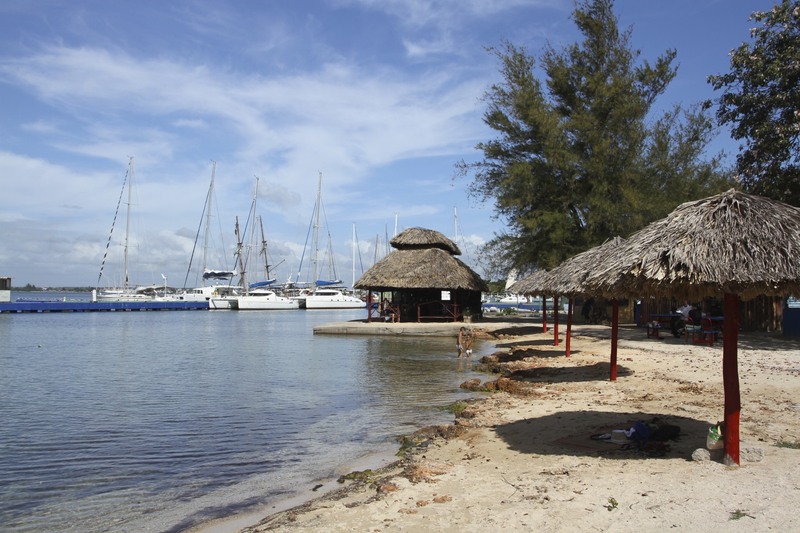 It was nice to relax over a long lunch and make plans for the next stage of the trip. We had some hard decisions to make. Not for the first time in our trip we’d run into an accommodation dilemma. 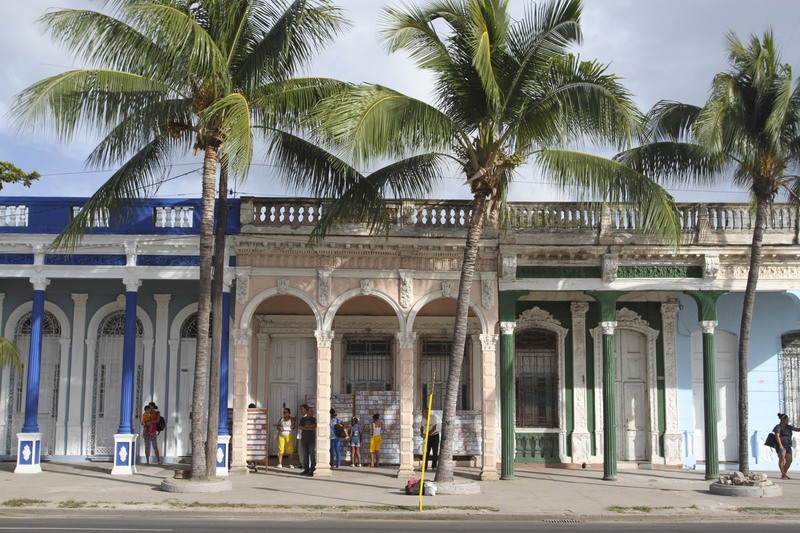 We were trying to find somewhere to stay at Cienfuegos’ beach area, Playa Rancho Luna, but without luck. Through our casa owners we’d managed to find a room but only for one night. 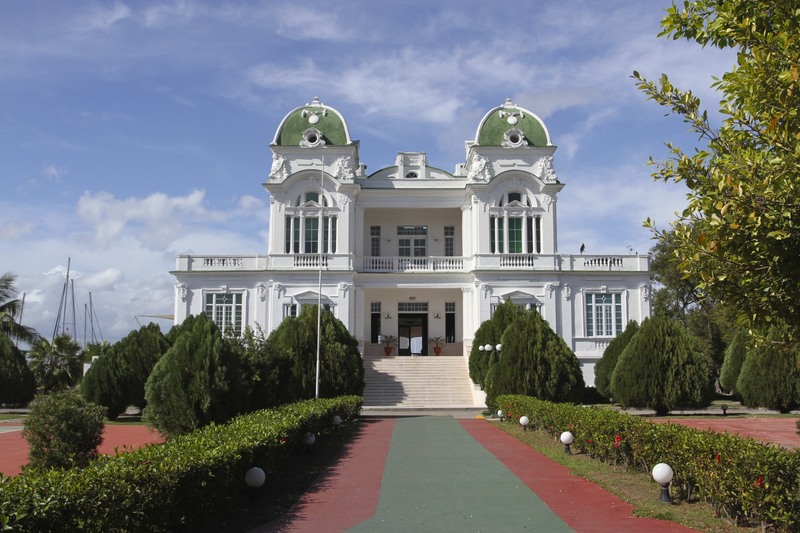 They were also trying to find somewhere to stay in Trinidad which seemed to be gripped by an accommodation crisis. In the end we decided to skip the beach because we’d found somewhere to stay in Trinidad. 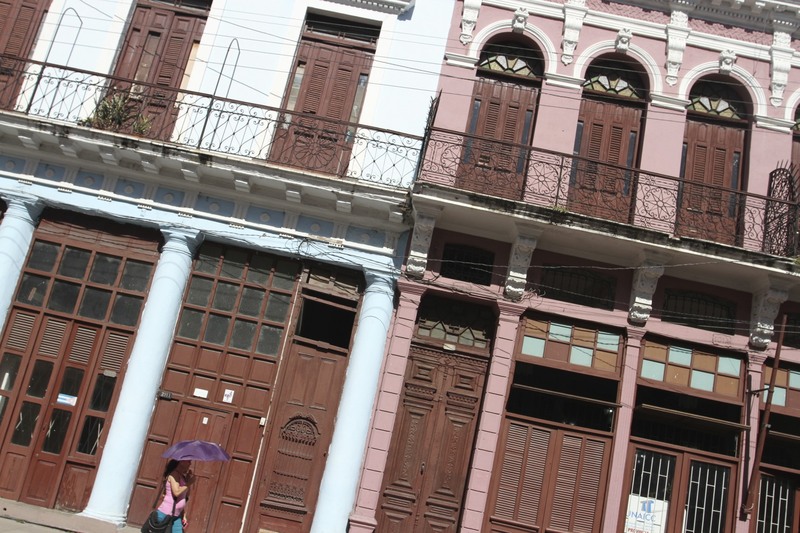 The friend of our Cienfuegos casa owners, who we’d be staying with, warned that tourists were wandering Trinidad’s streets trying to find somewhere to spend the night. That thorny decision solved we hit the town with two Californian women, Mattie and Diane, we’d met over breakfast. Cocktails on the Plaza Jose Marti were followed by more cocktails on a rooftop bar, which were followed by yet more cocktails. I can’t vouch for them, but we had shocking hangovers the next day. 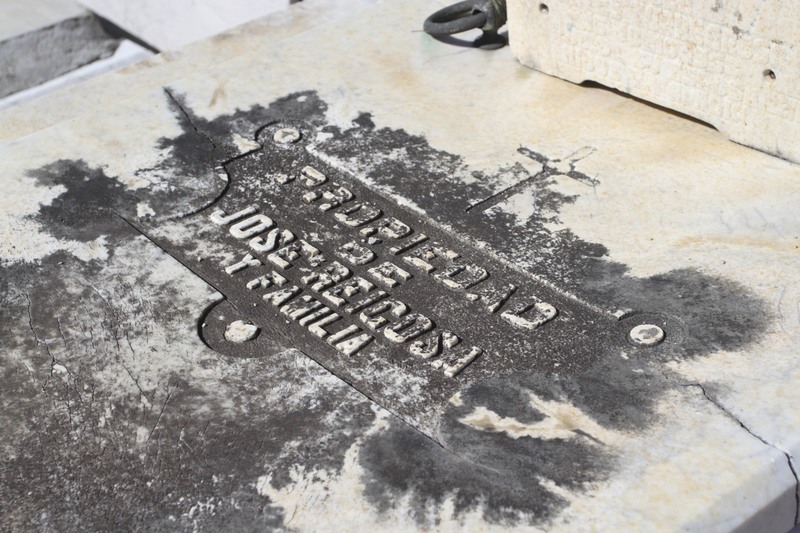 We had one final thing to do before leaving Cienfuegos: a visit to its historic cemetery. It felt fitting. 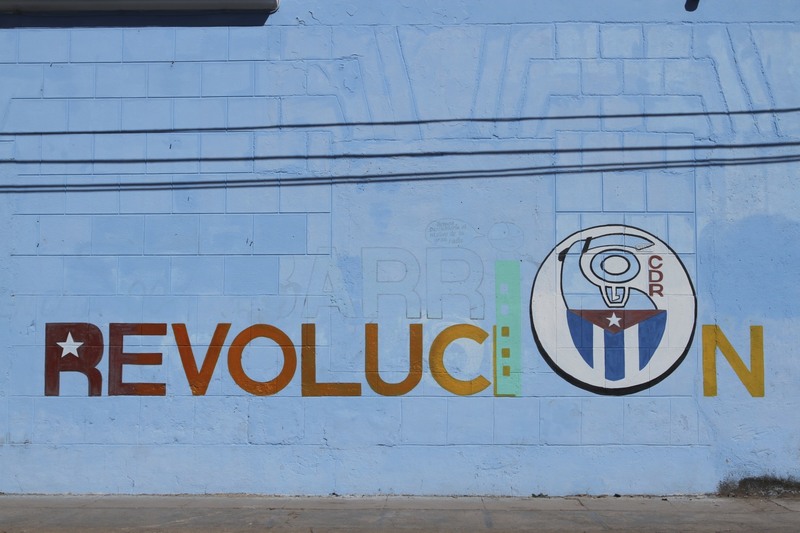 Ave 54 no. 4314 e/43 y 45. When you find yourself six hours into a supposedly five-hour journey and you’re nowhere near your final destination, you know something, somewhere has gone wrong. 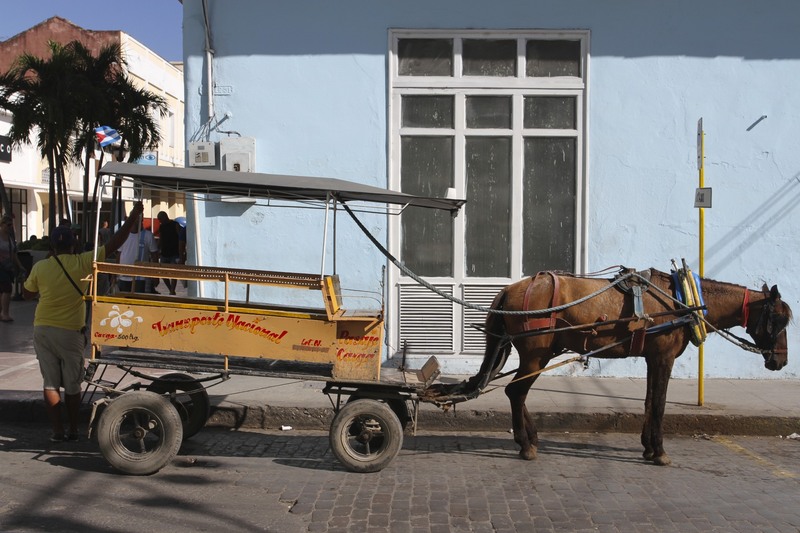 We were on our way to Cienfuegos and, crammed into the front seat of a 1970s Dodge with no end in sight, we were cursing our decision not to take the VizAzul bus. 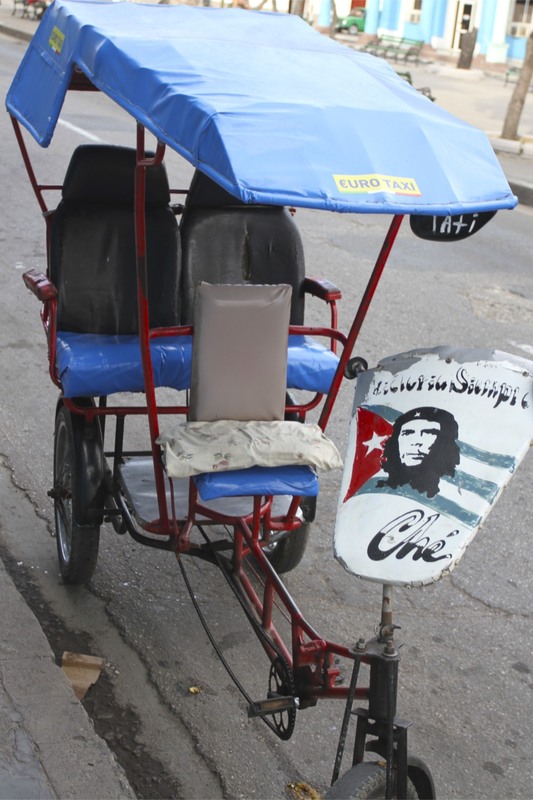 We’d booked a ‘minibus’ from the official-sounding CubaTours in Viñales. Ruben, their loquacious salesman and possible owner, had assured us that not only would the trip be quicker than the bus, it would be door-to-door and would only cost €3 more. 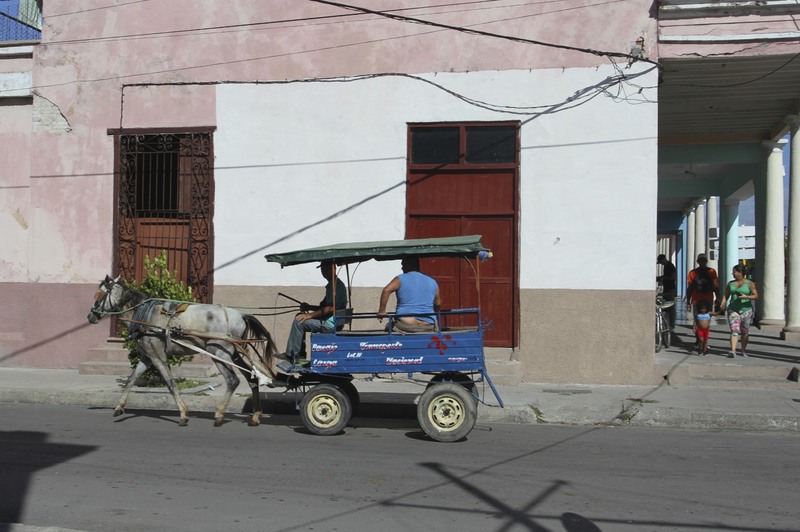 We were staying at the Finca la Guabina miles from anywhere so a pick-up from the ranch was ideal. 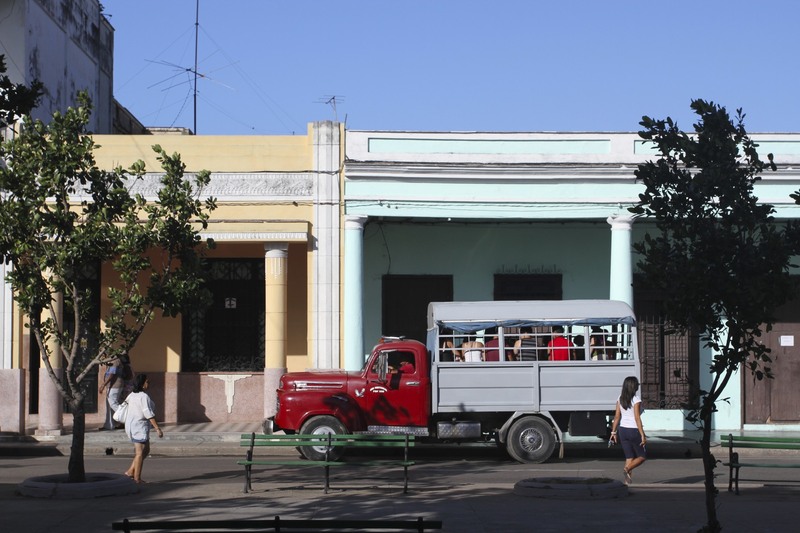 Our early morning pick-up seemed a lifetime ago as we stood in the shade of a tree by the side of a road just outside Havana. 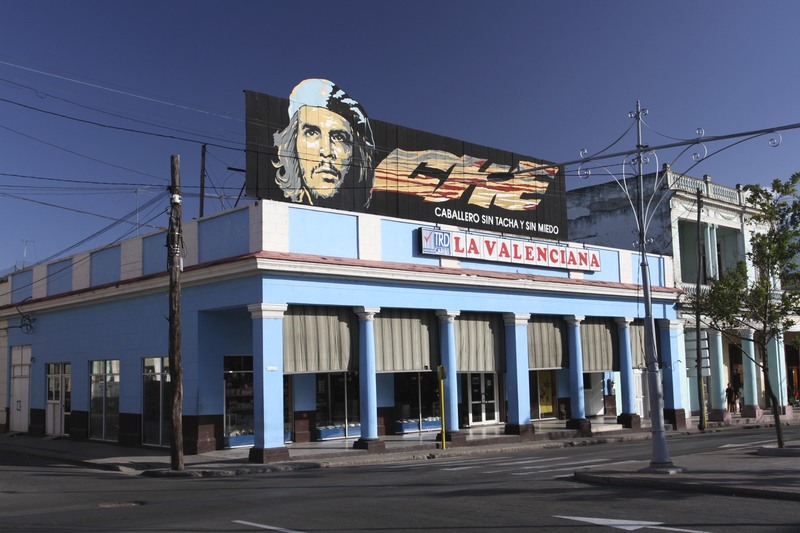 We were being ‘transferred’ from a 1980s Chevrolet Van driven by a certifiable lunatic, and were waiting for a car to show up that would take us the rest of the way to Cienfuegos. This was how six random travelling acquaintances and their luggage ended up like sardines inside a 1970s Dodge for five hours on Xmas Day. 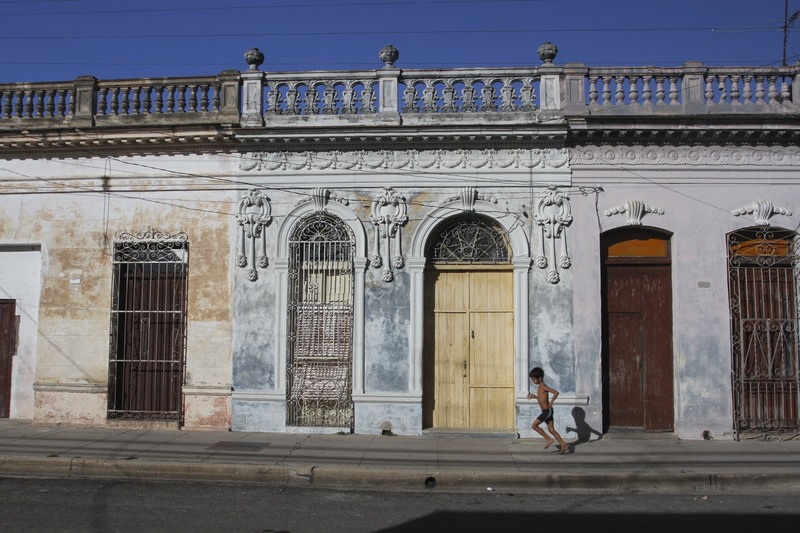 Tired, irritable and with a new appreciation of what entrepreneurship in the new Cuba looks like, we finally made it to Cienfuegos nine hours after setting off. 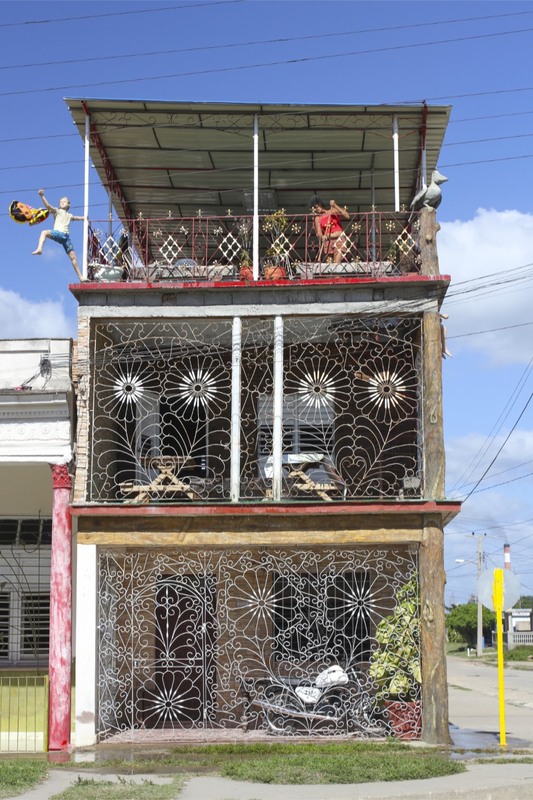 Not to worry, we had a reservation at a really nice casa particular recommended by our hosts in Viñales. 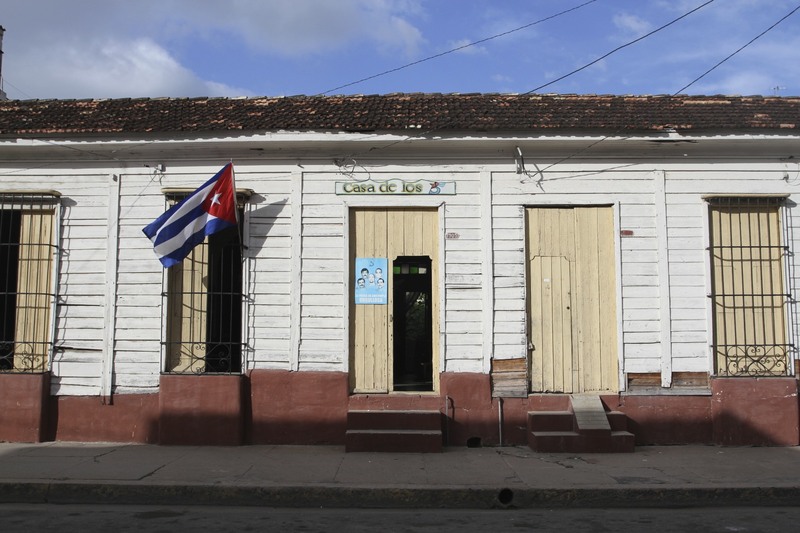 After driving around Cienfuegos for 45 minutes trying to find the casa, we arrived to discover our room had been given away to someone else. 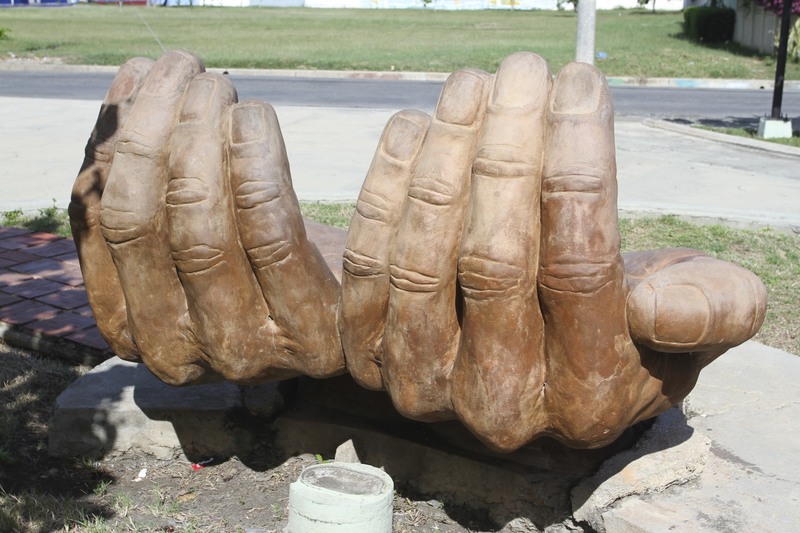 This happens a lot in Cuba. This final (bale of) straw landed heavily on the camel’s back. 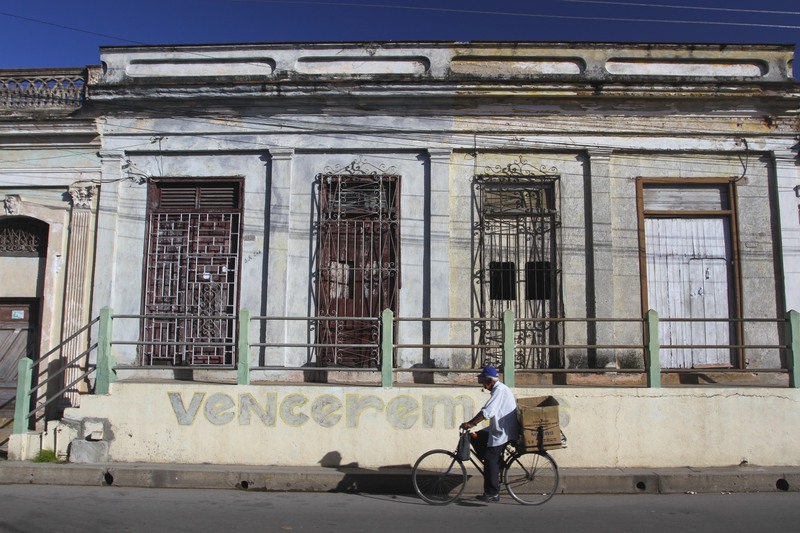 We were shown to a different casa a short walk away, the dark clouds of frustration gathering with every step. It turned out that our new casa hosts, Hector and Ilia, were wonderful. 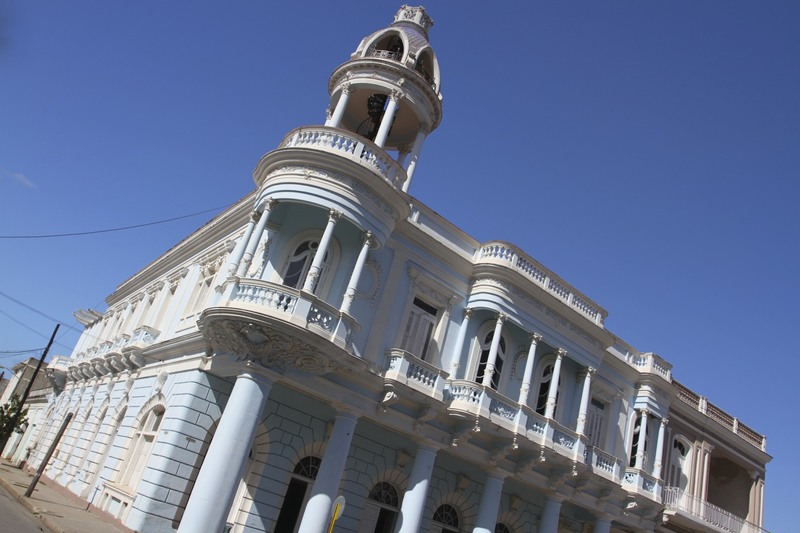 Helpful, knowledgeable, opinionated and very friendly, our time in Cienfuegos was greatly enhanced by staying with them. 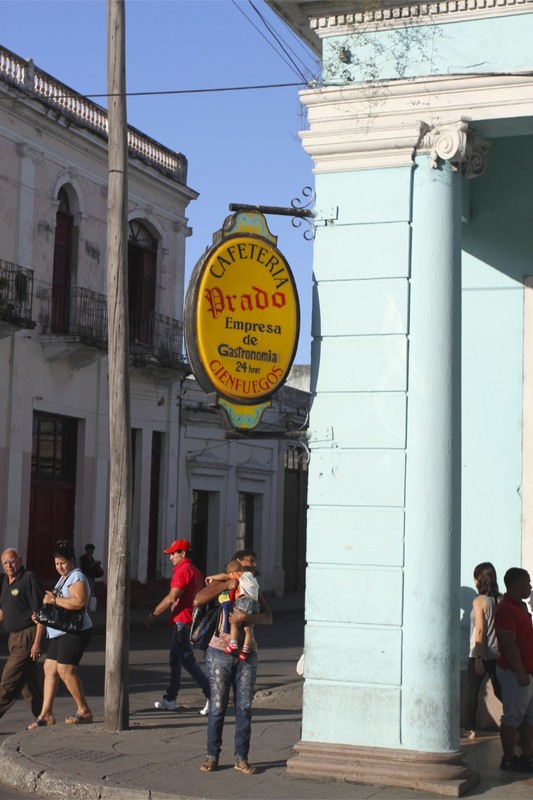 Their casa didn’t do food, but in Cienfuegos there are plenty of options for eating, including the new Big Bang Cafe on the Paseo el Prado. It does a good breakfast and has very friendly staff. 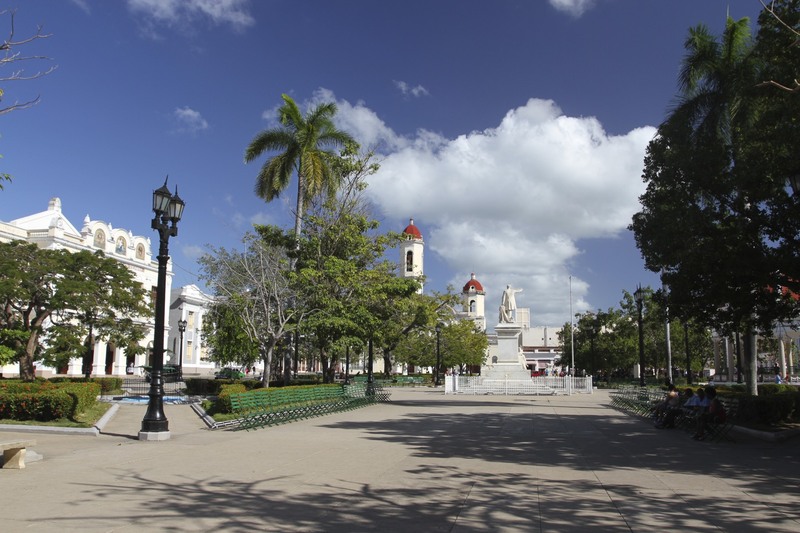 After our delayed arrival we just had time to walk to the magnificent Plaza de Armas in the historic centre of Cienfuegos before nightfall. Just this short walk took us past beautiful streets and colourful houses. The plaza itself was one of the prettiest I’ve ever seen, and was busy with young people and families strolling around and using the public wifi. It felt like an easy-going place to spend a few days. It was still Xmas Day and we decided that we needed to celebrate, even if it was just to celebrate the end of a long day sitting in decades-old American vehicles. On one corner of the square, next to the theatre, was a bar with an outside space. We ordered up a couple of mojitos, some cold beers and bought some peanuts from a passing woman (all the major food groups). Finally, we could relax.